Parts 1 & 2 Of The 2017 ‘Best Tipster Guide’ Out Now!! 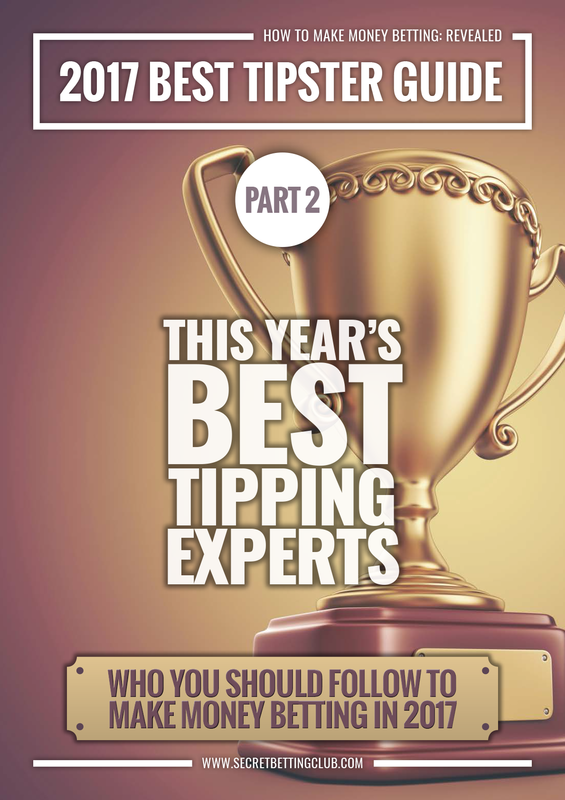 Part 2 of the 2017 Best Tipster Guide has just been released featuring detailed, independent reviews on 3 top tipsters to help you make money betting this year. With several significant tipster discount deals for you to enjoy worth £535, plus full access to the 2016 Best Tipster Guide – its our best ever value-for-money betting package! Available now via the very popular Platinum ‘Pro Punter’ membership – by signing-up today you can also save £38 on the cost of a subscription. The New Football Expert Averaging 70% Bank Growth Annually – With a profitable record of over 3000 bets since 2014. Over the past 6 years, he has advised 2600 bets and made 429.6 points profit at 15.4% Return on Investment. Access to the Best Tipster Guide also provides you with 3 more must-read reports, including Part 1 of the 2017 Best Tipster Guide and Parts 1 and 2 of the 2016 Best Tipster Guide! The Racing Tipster Up 1094% Bank Growth In 17 Months – Including 406% Growth Over The 2nd Half of 2016! And many more tipsters besides – all available to you as a Platinum Smart Betting Club member. All told – it’s quite the package with a huge amount of expertise and information available to you and all from a genuinely independent source. Here is why we are different. It’s fair to say that the expertise provided through both the Best Tipster Guide and the Platinum ‘Pro Punter’ package will give you every chance of making real money from your betting. Read more on how the 2017 Best Tipster Guide can help YOU! “Managed An Incredible Net Profit Of £11,595”..
Best Of All – Save £38 Currently!